Hanezawa Gardens. By Anders Edstrom. Mack, London, England, 2015. In English. 323 pp., 224 color illustrations, 8 ¼x10". 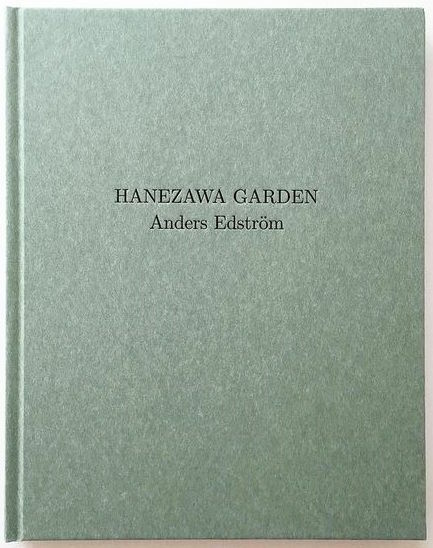 The opening pages of Hanezawa Garden seemed quite unpromising. The dedication, “for my Mother” — pretty generic. And what could be more banal as an opening spread than verso: a badly exposed image of shadowy people in what might be a hotel lobby or bar, center-weighted autofocus scooting past the two putative human subjects to land on and expose for the post-modernist vase/lamp in the background, and recto: a comparable photo, flash-lit, adequately exposed and focused, more legible but only marginally more interesting for the gain. Both images seemingly from the same underwhelming event, captured on film processed, for all we know, by big-box one-hour photo circa 1982. The kind of photos that may have seemed important at the moment, but lose whatever import they had once the trip is over and the “memories” come back from the processor. Well, don’t judge a book by its cover, or its first half signature. First impressions, in this case, are unquestionably deceiving. Maybe intentionally so. All of the above gain significance as we read further into Edström’s subtle, ingenious narrative. Hanezawa Gardens. By Anders Edstrom. Mack, 2015. Turn to the second spread. An ordinary, but well-seen and -exposed nighttime view along a snowy lane, tire tracks and footprints suggesting the lightness of the precipitation and confirming the truly pedestrian aspect of the image. Halation at the top of the frame, an attention-grabber issuing from a streetlight, hovers above a shadowy, indistinct hillside. The recto is graced with a day-lit image of imminent architectural ruin, the kind of decomposition photography loves to record, present here in an Asian vernacular. Admittedly, a reader may have been predisposed toward that accent, given “Hanezawa” in the book’s title and the opening pair of photographs, set in an apparently Asian environment. Nonetheless, it’s there to see — which, as I think about it, is a fine mantra with which to approach this book (and a lot of the most gratifying photography too, though that’s the subject for another essay elsewhere). Just look. Just look! So many movies have opening scenes that, upon reviewing, offer a narrative overture, a compression and foreshadowing of things to come in the work as a whole. Edström has exquisitely emulated that trope in this book. In four pages he has set the scene for the subsequent evolution of the book. The story, as it unfolds page by page, is one of change. A dilapidated, largely overgrown piece of developed property is transformed into new construction. Fences and tarps go up, intruding on the night scene of the beginning. Heavy equipment arrives to usher in the new by razing the old. Edström has shown us how natural processes were doing the work, but all those meetings in hotel lobbies and around shiny architectural models insinuate that waiting for eventual decay won’t meet deadlines. That brilliant street light in the second-spread photograph signaled the point of contention, the target for developers. Those of us who love worn-in things, especially those that reveal natural materials and building modes as do the spaces recorded in the first two-thirds of Hanezawa Garden, know the fate of that hillside lot all too well. Edström builds the story, clue by linking clue. Those opening spread images take on weight as foreshadowings of the disruption to come. Use your best three-dimensional visual memory to unfold this origami narrative. As the building disappears, the story grows. Read carefully, then return to the beginning and read again. Read forward and backward. Stop on a spread, then reverse direction. Find the clues. The images tell the story; they lay out the space, including the streets around the hillside lot, in a bread-crumb diagram. There is no cinematic establishing shot, no overall view that gives us the whole scene. That point-of-view would have involved some extraordinary mechanics, a helicopter, hot-air balloon, cherry-picker crane, or a friendly god. This is, again, a pedestrian view, a tale of dismantling assembled detail by detail. I must admit, I don’t always read essays in photography books. (Another topic for another essay elsewhere.) I like to let the photographs do the talking. In this case, the photographs speak so eloquently I read the essay in order to ascertain and amplify the structure in which they have achieved such potency. Without revealing much of C. W. Winter’s text (contained in a booklet loosely inserted in the back, indicative perhaps of its ancillary, expository relationship to the book’s essence), I will offer the following excerpt as an enticement.